In Witchfinder by Sarah A. Hoyt, Seraphim Ainsling and Gabriel Penn secretly defy the king's edict to rescue witches facing death on other Earths. Meanwhile, Nell strives to ransom her lover's freedom by spying on Duke Seraphim, and so finds herself caught up in the Duke's heroic escapades. After Sydell, the king's spy, confronts Nell for the information she owes him, an attack on Seraphim and Gabriel throws the three of them into the spiral of a much larger plot that could destroy Avalon, Fairyland, and the surrounding alternate Earths. Witchfinder boasts a fine balance of female and male protagonist voices headed by Nell, Gabriel, and Seraphim. Although it may appear at first as if Seraphim is the typical heroic main character, Nell quickly comes into the mix as an equally powerful voice, and Gabriel becomes more important as the larger plot unfolds. Seraphim, Nell, and Gabriel's intertwining paths culminate in magical battles that shake the foundation of their worlds. Hoyt brings us a fun twist on the heroic trope of a knight who runs off into danger, saving maidens along the way. The many iterations of Avalon, most of them calling themselves Earth, provide everything from fairies and dragons to the machines and iron of the modern world. Witchfinder's plot proves as complicated as its multiverse, evoking comparisons to Roger Zelazny's Nine Princes in Amber. But where Zelazny gave us a plethora of princes and princesses at war, Hoyt offers us compassionate characters with deeper ties of brotherhood and romance. 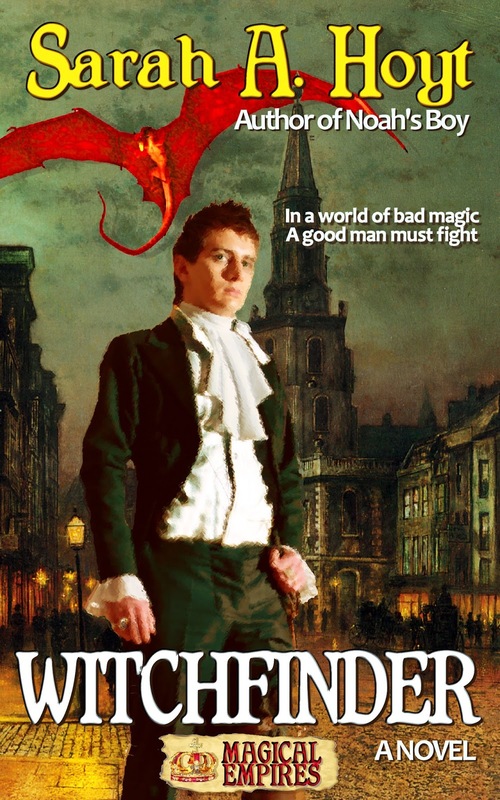 Witchfinder is an epic adventure fantasy that draws the reader along on a enthralling journey of heroism through colorful alternate universes, pitting cousin against cousin and human against fairy as greed threatens to destroy all. You can read the beginning of Witchfinder [ here ], and purchase the book on [ Amazon ] and [ Smashwords ]. As a bonus, Witchfinder has an interesting real-world origin: it started out as chapters posted to Sarah A. Hoyt's blog. Hoyt is posting Rogue Magic, Book 2 [ here ].